PINOLE, Calif. — When it comes to fighting the Trump administration’s immigration policies, California has two “resistances.” There’s the official one, conducted by politicians, that includes the state’s landmark “sanctuary” law. Then there’s the unofficial resistance, which includes people like Ann and Kent Moriarty. In July, the couple got a call from an immigrant advocacy group about an asylum seeker who had spent seven months at an Irvine detention facility. The woman had just been granted a $15,000 bond and needed a place to stay. The Moriartys took in Veronica Aguilar, from El Salvador, and showed her around their Bay Area neighborhood. They taught her how to navigate public transportation, where to get healthcare and how to sign up for English classes. Ann Moriarty said her religious faith compels her to welcome strangers. But she said President Trump’s policies made it easier to do what she considered the right thing. Since June, nearly 800 people around the country have pledged to offer housing through California-based Freedom for Immigrants. The organization has raised more than $100,000 this year to bond 50 immigrants, including Aguilar, out of detention. Immigrants eligible for release from detention must provide the address of a sponsor to immigration authorities. Other organizations, including those associated with the sanctuary church movement, are also opening their doors to detained migrants in need of transitional housing. The Moriartys are registered with U.S. Immigration and Customs Enforcement as Aguilar’s legal sponsors. Kent, who speaks fluent Spanish, works as a mechanical engineer, and Ann writes science curriculum at UC Berkeley. In the past, the couple has housed young unaccompanied minors as they aged out of foster care. 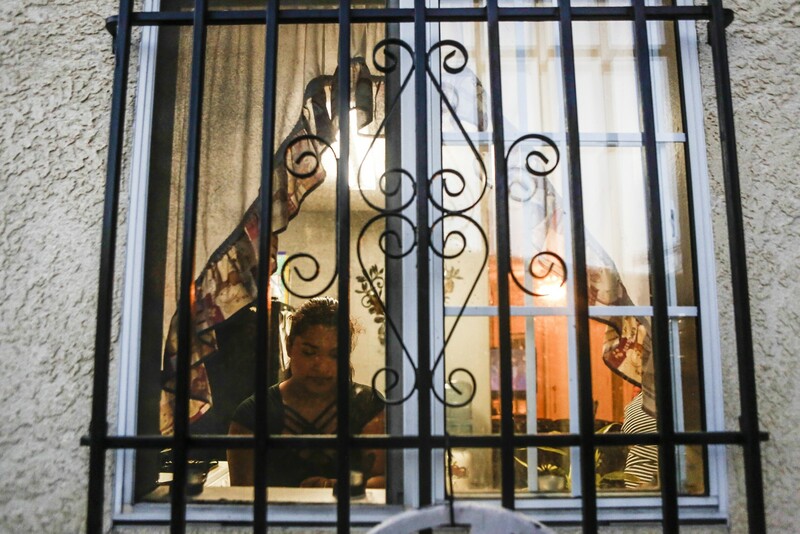 Aguilar’s journey to California started when she fled her home just north of San Salvador. At age 20, she said, six months into her relationship with a man from her community, he shot and killed someone. She said she hadn’t known he was a gang member or that she was pregnant with his child. While the man remained in prison, Aguilar said, members of his gang pressured her to maintain the relationship. She refused and assumed that was the end of it. Then two years ago, some of those gang members were released from prison and threatened to kill her. Aguilar fled to her mother’s house two hours northeast, but the gang members found her a year later. In October, she bought a bus ticket to the Guatemalan border with Mexico, leaving behind an 18-year-old daughter and her now 15-year-old son. From there, she joined a caravan of 300 migrants who sought U.S. asylum a month later at the border in San Ysidro. In early May, an immigration judge denied Aguilar’s application for asylum and ordered her deported, according to court documents. Judge Nathan Aina said she had failed to provide sufficient proof that she would likely be persecuted or tortured if returned to El Salvador. While she awaits her appeal, Aguilar said, she knows she can count on the American family that embraced her. In nearby Concord, Joe Schellenberg and Mieke VanHout got a call in early August from the lawyer of a detained Guinean man they had been preparing to host, saying that he couldn’t be released. Within three days, the couple had 70 letters and signatures from members of their Unitarian church in support of the young man, who is seeking asylum. The man, who asked that most details about his situation be kept confidential out of fear for his safety, was released on a $5,000 bond a couple of weeks later. Schellenberg and VanHout — retired and empty-nesters — have volunteered for years serving detainees and farmworkers. After Trump took office, they decided to get more involved with Freedom for Immigrants. For VanHout, a former nurse, the idea of allowing a stranger to live with her stems from her youth. “I really thought I could change the world,” she said. Her husband sees it more simply: “I miss my kids,” he said. The Guinean man, a native French speaker, calls them “mom” and “dad” — a sign of respect common in his culture. “My whole life has pretty much been white privilege,” said Schellenberg, a former financial manager. But his own children exposed him to different cultures. One son married a Chinese woman, another a Venezuelan woman and another a Serbian woman, and his daughter’s boyfriend is from Poland. Immigrant advocates say there is a huge need for sponsors. Earlier this year, Clergy and Laity United for Economic Justice started getting calls from lawyers with detained clients who were eligible for release but didn’t have sponsors. The Los Angeles-based advocacy organization, known as CLUE, has long been involved in the sanctuary movement, in which religious institutions shield immigrants in the country illegally from deportation by offering them refuge. ICE historically has avoided conducting enforcement at “sensitive” locations, including churches. Now congregations that had already established themselves as places of sanctuary are opening their doors to asylum seekers and other migrants being released from detention. One of those congregations is Pastor Maria Elena Montalvo’s of Grace Evangelical Lutheran Church in Bell. But since the building lacks a shower, she is hosting a Salvadoran couple and their 2-year-old daughter in her Compton home. Lourdes, 20, her 24-year-old husband, Raul, and their daughter, Nicolle, arrived at the border near Tijuana in March and requested asylum. The Times is not using their last name because they fear persecution. Lourdes and Nicolle were detained for a day and then released, while Raul spent four months at the Adelanto Detention Facility near Victorville. Lourdes said she was raped by three gang members at age 11. Her mother had helped authorities prosecute the men and fled to Mexico in 2016 after the attackers repeatedly threatened her and demanded money. Last year, one of the men was released from prison and wanted revenge, Lourdes said. The day after his release, the gang member stopped Raul in the street and demanded to know where his mother-in-law had gone. He threatened to take Lourdes and “disappear” him and their daughter. The family joined Lourdes’ mother in Guadalajara within days. But after less than a year, Lourdes’ mother started receiving calls from the gang members telling her they knew where she was. The family fled again. CLUE raised the $3,000 to bond Raul out of detention and connected the family with Montalvo. Now they go to church with her every Sunday. The pastor said it’s not the first time she’s taken in a family, and it won’t be the last. Even with sweltering heat and smoke-filled skies above, over a hundred caregivers at West Anaheim Medical Center held fast yesterday and walked the picket line in front of the hospital. Represented by the National Union of Healthcare Workers (NUHW), the striking staffers cited unsafe conditions on the job due to short staffing and low wages as chief reasons for the 24-hour walkout. The strike, a first ever at West Anaheim Medical Center, follows an informational picket that took place last month. Negotiations broke down when Prime Healthcare Services, who operates the facility, refused to meet the union’s demand for a 24 percent wage increase. The way NUHW tells it, Prime representatives informed workers at the bargaining table that they “had the option to leave” and find work elsewhere. Many, like Jeanne Waite, who needs the health insurance offered by her job in order to pay for her husband’s cancer treatment, felt the option offered is no option at all. [NTN 24] Vence plazo para que más de 2.500 niños se reúnan con sus padres en EE. UU. Este jueves vence el plazo que un juez federal dio para que se produzca la reunificación de 2.551 menores de edad con sus padres, que fueron separados por el Departamento de Inmigración de Estados Unidos. Sin embargo, 900 padres no son elegibles, 463 padres han sido deportados y 127 padres firmaron la orden de deportación y aceptaron que sus hijos apliquen a un asilo político. De este modo, se estima que aproximadamente 1.187 niños se reunifiquen con sus padres. On the day the government rushed to reunite dozens of families separated at the border, one immigrant father showed up to a federal appointment downtown fearful that he would be deported without his 6-year-old son. Hermelindo Che Coc came from Guatemala in late May to seek asylum with his son, Jefferson Che Pop, his attorneys said. His son was taken from him with little explanation, he said, and sent to a shelter in New York. Immigration and Customs Enforcement officials asked Che Coc on Tuesday morning to appear before an officer as part of his removal process.